James Scully competed at Paralympic Games in 2012 and 2016. World and European bronze medallist James Scully has announced that he is retiring from Paralympic swimming. The 25-year-old last represented Ireland at the World Para Swimming Allianz European Championships that took place in the Sport Ireland National Aquatic Centre last August. The Meath man began his swimming career when he joined the National Aquatic Centre swim team in 2006. He finished in fourth place at the 2010 World Championships in Eindhoven also finishing in fourth place in the same 200m Freestyle at the European Championships in 2011. In 2011, he went on to be named as the Disability Swimmer of the Year before competing in his first Paralympic Games in London 2012. Between 2013 and 2014 James enjoyed his most successful period in terms of results as he won a bronze medal at the World Championships in Montreal in the 200m Freestyle and in 2014, he added two European bronze medals, in the 100m and 200m finals. 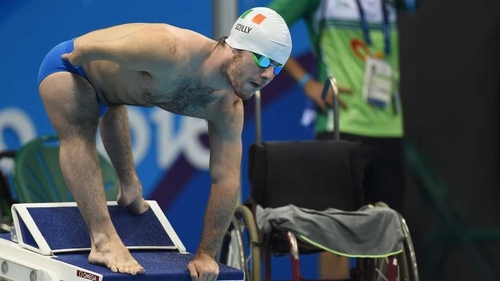 Scully competed in his second Paralympic Games when he reached finals in both the 100m and 200m Freestyle, swimming his best ever times in both events as he finished in seventh place overall. He said: ‘I feel proud of what I achieved competing for Ireland. It was fitting that my career came to an end in the NAC which was where it all started for me 12 years ago. Paralympics Ireland CEO Miriam Malone said: "I would like to wish James all the very best in the future. He represented Ireland with great distinction at two Paralympic Games and he won medals for his country at both European and World level. We look forward to seeing what lies ahead for James and I hope that he will remain involved with Paralympic sports in some capacity."